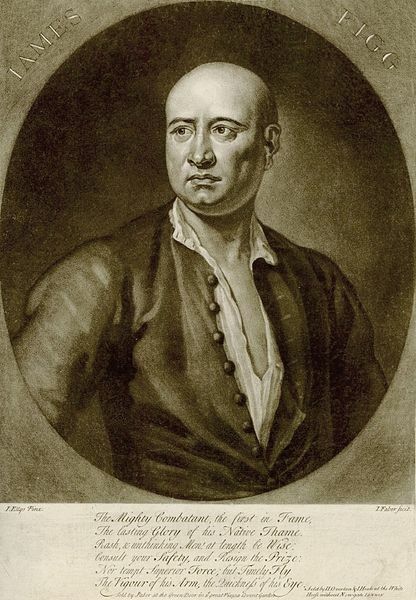 One of Hogarth’s most popular and pirated early engravings. Its publication did much to spread Hogarth’s fame to the continent. The scene is said to be the interior of the St. John’s Coffee House, Temple Bar, the time on the clock is 4 a.m and the candles are all burnt out. The maudlin and drunk patrons, all men, are gathered around a large circular table on which stands a huge punchbowl, empty glasses and broken clay pipes. 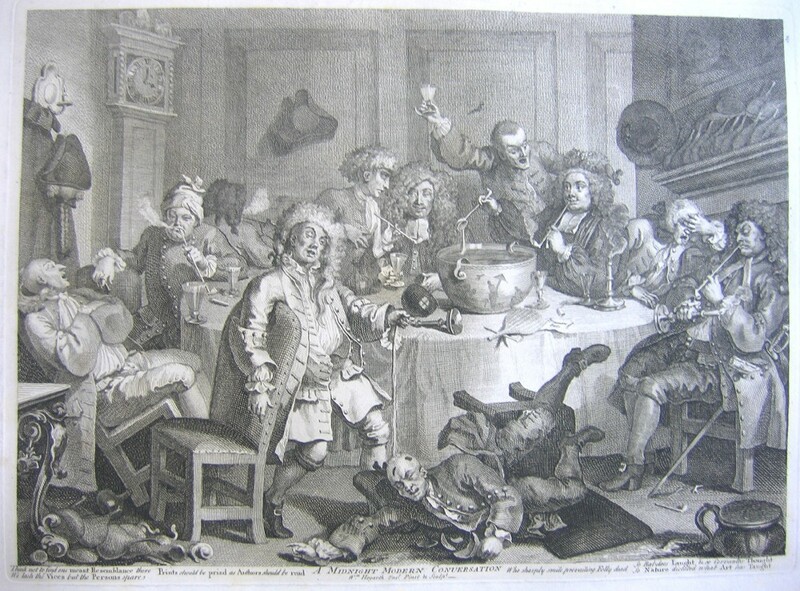 In the foreground a drunken man, said to be Hogarth’s friend Dr. Ranby, unsteadily clings to the back of a chair and pours a bottle of wine onto the bald head of the prostrate figure of the prizefighter James Figg. On the far right a politician in a huge periwig (possibly Hogarth’s friend Ebenezer Forrest) sets fire to his ruffle instead of his pipe, seated next to him a man in a tie wig is about to be sick into the fireplace and complacently ladling punch and smoking a pipe on the far side of the table is the parson Dr Cornelius Ford, a reprobate cousin of Dr. Johnson. Behind him is a noisy man waving his glass in the air, said to be John Harrison, a tobacconist, the lawyer sitting with his wig askew on Ford’s right is Kettleby ‘a vociferous bar Orator’ and the glum, deaf man in a white turban is a bookbinder named Chandler who worked for Hogarth. On the extreme left a man has fallen asleep with his mouth open in a tilted back chair, hats and discarded wigs hang on the wall, while on the floor is a pile of empty bottles, broken pipes and an overflowing chamberpot.